He just couldn't stop smiling. Thanks to the joyful visit from a creature he’d loved throughout his lifetime, for a moment Patrick Saunders became a kid again. Patrick was a patient at North Devon Hospice, an end-of-life care facility in the UK. 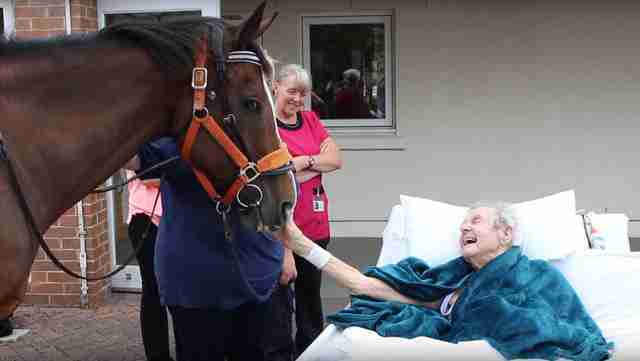 There, his nurses quickly learned about his deep affection for horses, which had been a major part of his life since childhood. 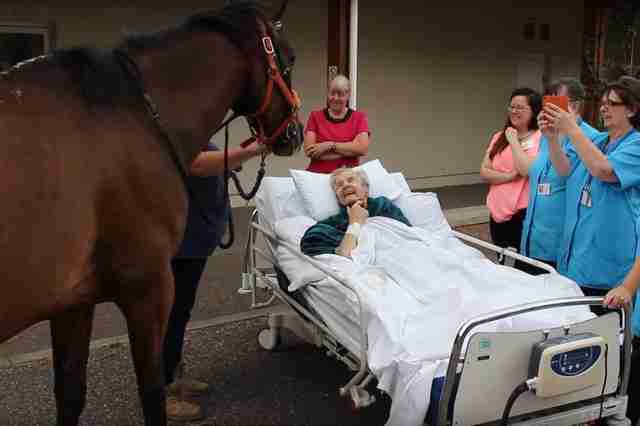 Though his riding years were long behind him, as he was confined to a bed in his later years, Patrick's heart and spirit never strayed far from the happy memories he shared with those beloved animals. And on one of his final days, he wrote a new memory — when a horse came to him. "I said, 'If he is real horse man, he would want to see a real horse.' So I brought big boy Victor up," Sim told The Dodo. 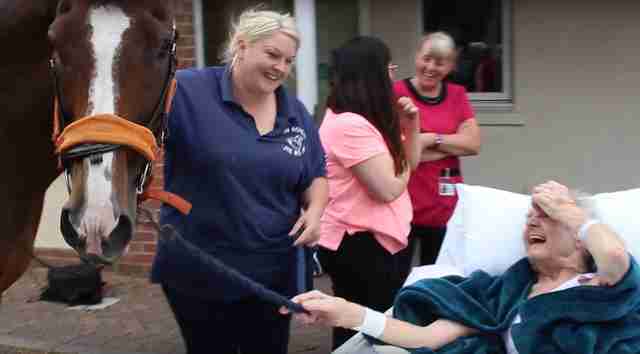 "Patrick's last wish was to see a horse again to brighten his day." It was clearly the right choice. Patrick was wheeled out front of the hospice in his bed, and his face lit up when he saw the majestic Victor standing sweetly before him. "His face was beaming. The whole place just brightened up. Patrick was thrilled. His eyes and his big smile; I was taken aback," Sim said. "For a spilt second, he must have forgotten all his worries with just a visit from Victor. Although it wasn't just a visit, it was an incredible experience with beautiful memories for his family." Patrick, who'd had a recent string of difficult days, was himself again in that moment. During the visit, Patrick got to stroke Victor and feed him a carrot — small but meaningful gestures that brought him peace. 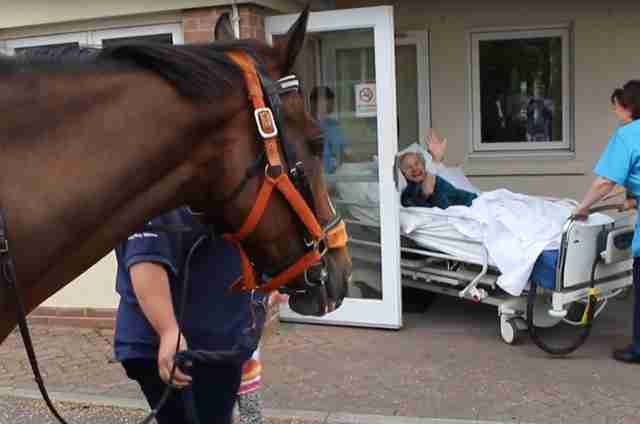 The horse, meanwhile, appeared to sense what a special moment it was for the man. "Victor stood solidly and took in everything going on around him," Sim said. "He knew he was doing a good thing." Like all good things, the visit eventually came to an end. But as Patrick waved goodbye, he seemed more ready than ever to embark on his next adventure with a full and happy heart. And soon he did. Three days after Victor's visit, Patrick passed away. But though he's now gone, he's left something unforgettable behind — proof of the healing and comfort animals can bring to those who love them most. "His laugh and smile will live with me forever," Sim said. "Patrick showed no sadness and made each of us smile with pride."